SmartProcurement hosted its 2nd annual SmartSourcing Conference on the 7th and 8th of October 2008 at the Irene Country Lodge in Centurion, Pretoria. This two-day event, sponsored by Purchasing Index, Tech-Pro Personnel, Commerce Edge Procurement Training, Volition, IPSA, BEESA Boxsmart and EES-Siyakha, attracted more than 100 local and international delegates from all corners of Procurement and Supply Chain Management (SCM) in both the private and public sectors. The attendants reflected a 20% growth on the 2007 conference figures, which reaffirms the SmartProcurement viewpoint that the procurement and supply management fraternity in South Africa welcomes an annual public forum. Forums are especially important to network with colleagies and suppliers, to exchange ideas on current best practices and to identify leading world-class trends. The theme of this year's conference was ‘Strategic Cost Management in Turbulent Economic Times’. In his welcoming address, Bernie van Niekerk, Editor of SmartProcurement and CEO of Commerce Edge Procurement Training, noted that “for the past 10 years most benchmarks have indicated that organisations can extract savings of at least 5% on their overall third party expenditure by focusing on better purchasing and supply management. Many procurement and SCM professionals today would agree that 5% is possible – in some cases even easy – and that even higher numbers can be achieved, provided that this is the first time that an organisation is looking at optimising its procurement function”. Van Niekerk emphasised that this year’s conference succeeded in putting together a high powered panel of relevant experts with practical case studies that would provide frameworks for delegates in taking cost reduction to the next level: “The speakers will share their thoughts and experiences with delegates whilst conveying four fundamental procurement strategies that organisations can harness to advance their cost reduction operations on a continuous and sustainable basis. These four strategies will, in turn, protect organisations against volatile price fluctuations in these testing economic times”. Creating world-class cost management infrastructure for optimising, managing and measuring cost. Clem Sunter (internationally acclaimed scenario planner and popular motivational speaker) on the topic of “The China Game”. As we know, China embodies the opportunities and challenges of sourcing from low-cost countries. Sunter emphasised that the rise of China constitutes a historic shift as the West has reigned supreme on the economic front for the past 600 years. This, in turn, bodes will for the future of Africa with whom China is cultivating long-term and sustainable trading relationships. Sunter ended his presentation by giving the thumbs up for the procurement function: "Procurement will be the linch-pin for organisations in the hunt to be profitable. Managing spend can a bigger priority than sales". **Sunter's talk is fully covered in the article “‘The China Game' and the Value of Scenario Planning in Turbulent Economic Times”, in this month's SmartProcurement issue. Alan Low (Managing Director, Purchasing Index) on the topic of “Price Trends for the Next 12 Months”. Low argued that in order to protect your organisation against volatile price fluctuations you need to be well-prepared, well-informed and use tried-&-tested models to anticipate the future. A spend category that is especially susceptible to price fluctuations is air travel, and thus the role and influence of procurement is critical as: "Savings is not just made when reducing the cost of air travel (2%) or in reducing the fees of your Travel Management Company (3%), but in getting the people in your organisation to change their behaviour". Armin Philipps (Senior Strategy Manager, Deloitte) on the topic of “Global Sourcing in Practice”. ***Regretably, Armin Philipps was unable to attend due to personal matters. Kayn Woolmer, Senior Executive: SCM, delivered Philipps' presentation aplomb. Western business logic does not apply. It is a fun project if no deadline applies. You must persist - things will come your way eventually. Patience is the essence of success. "You don't know China", means they disagree. "New regulation", means they have found a way to avoid doing something. "Internal regulation", means they are mad at you. "Basically no problem", means big problem. When you are optimistic, think about rule #2. When you are discouraged, think about rule #1. Jackie Li (Senior Consultant, Beijing Axis) on the topic of “Low-Cost Country Sourcing Opportunities with specific reference to China's Sourcing Advantages and Challenges”. To understand China as a sourcing destination you need to engage with an organisation that prides itself in being a business bridge between the sourcing country and the supplier. Li, from the Beijing Axis, is a sourcing specialist and could provide delegates with hands-on insight into the methodology and processes involved when doing trade with China. A useful starting point is to appreciate the sheer enormity of this Asian giant that in the past dominated world trade for over 1000 years. **In next month's SmartProcurement we will be providing a detailed report on Li's presentation. Prof. Barry Spitz (a well-known international tax expert) on the topic of “Tax and Legal Implications for Procurement in the Global Economy”. This presentation's subject poses a particular challenge to the ongoing professional development of procurement professionals as it is not often they are confronted with understanding the financial intricacies that prevail in the international procurement of goods and services. International procurement practice includes a wide spectrum of disciplines, such as Debt Factoring, Advertising, Travel, Communications and Training, to name but a few. "One is dealing with the interaction and interrelationships between highly sophisticated tax regimes. It is a mathematical process and each of you need to do the numbers in detail if you are to make the double whammy, namely the savings and save on tax". Anthea Saunders (Executive: Supply Chain, TFMC) on the topic of “Setting up Low-Cost Supply Clusters and Identifying which Supply Industries are Ripe for this Global Trend”. Saunders is adamant that the route to achieving year-on-year cost reductions from suppliers is in the development of low-cost (supplier) clusters. A low-cost cluster is defined as the unification of various organisations joining together to benefit from volume purchases. The goal is thus to transfer the benefit from the supplier, to you, and ultimately the end user. Low-cost clusters have been implemented with great success in the SA automotive industry (Ford, VW, General Motors) and Saunders is certain that such a model would be equally relevant to other areas of manufacturing and mining. The above business model will, by definition, enable procurement and the supply base to partner on a profitable and sustainable basis for all stakeholders. Dennis Naidoo (CPO, TFMC) on the topic of “Designing for Value – Utilising Value Engineering / Analysis to Drive Costs Down”. In achieving year-on-year cost reductions from suppliers, you need to thoroughly understand the difference between 'value' and 'cost'. Value engineering is, in essence, a systematic method to improve the value of goods and services by using an examination of function. Value, as defined, is the ratio of function to cost. Value can therefore be increased by either improving the function or reducing the cost. Deon Mocke (Vice President Africa, Quadrem) on the topic of “Sourcing Solutions for the Global Marketplace”. Mocke also highlighted several benefits when utilising the infrastructure and resources of an e-procurement exchange with a total global footprint in achieving global sourcing goals in a best practice environment. Nic Badenhorst (independent consultant and ex-CPO, Mittal Steel) on the topic of “Collaborative Cost Management with Key Suppliers”. The basis of efficient cost management is collaboration with your key suppliers. "When an organisation applies the advanced principles of total cost of ownership they will be astonished at the value that is released. At the end of the day managing suppliers is not an arm-wrestling exercise. It is a structural intervention in cost drivers that assist organisations, and the country, to do business more cost effectively". 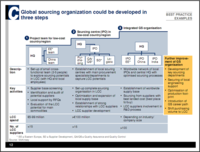 Jan Weydringer (McKinsey Consulting) on the topic of “Strategic Models for Sourcing from Low-Cost Countries”. Most importantly, Weydringer identified training and development as key differentiators in a world-class global sourcing organisation. "You must continually build on the job and show your people how to improve by using training centres and schools of excellence to develop your personnel to their optimum abilities". Nathanael Siljeur (Head: Procurement Strategy, Exxaro) on the topic of “Enabling Sustainable Cost Reduction through Comprehensive Performance Tracking of TCO”. Adopt a standardised approach in the definition and application of savings. Establish the credibility of reported savings. Remove any doubt as to how measurement is done. "At the end of the day you need to 'bank the savings' to impact the bottom-line and the only way to do that is to audit your own hard work". Mark Bruno (Director, World Trade Centre, Johannesburg) on the topic of “The Financial Complexities of Cross-Border Trade and Risk Management in Sourcing from Low-Cost Countries”. Delegates were also reminded of the immense value of the Internet to global sourcing: "It has no borders and by using it, you mitigate a lot of cost." Karen van Vuuren (General Manager: Group Supply Management, Transnet & President of IPSA) on the topic of “Innovative Strategies in Sourcing from Global ‘Best-of Breed’ Suppliers". Van Vuuren commenced her presentation by outlining the strategies and tactics that Transnet employed to optimise the above mentioned procurement spend and how these strategies and tactics helped SA grow in the process. A locomotive is an asset with a 40 year life-cycle. The present SA fleet has passed its sell-by date and needs to be replaced along with the coaches. In the mean time, due to not replacing the fleet systematically, the country has lost its competitive capacity to make locomotives and coaches, and so, by necessity, they must be sourced from overseas. The Capex for locomotives is R6 billion, which is 1/3 of the life-cycle cost of keeping them running for 40 years. This means that Opex (Operational Expenditure), which is 2/3’s of the life-cycle cost, R12 billion, is the ongoing, long-term and ‘real’ money. In the global market of procuring locomotives and coaches, the SA Capex spend is actually too small to make any difference to the price, etc. What was a purely procurement project by a single SOE in SA has suddenly turned into a regional initiative to add and multiply value across the sub-continent. Please note: SmartProcurement will run a special series of articles on the main presentations dealt with at the 2008 SmartSourcing Conference. The first article (in this newsletter edition) deals with “‘The China Game' and the Value of Scenario Planning in Turbulent Economic Times” as based on Clem Sunter’s keynote address.